Lekorna is known for its shortcrust mini-tarts. "Shell” wafer tarts variations are almost the same, but they are wafer tarts. You can fill them with any sweet or salty filling you enjoy: fruits, berries, creams, even cheese or mushrooms. 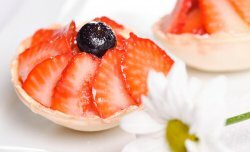 Try using wafer tarts for baking: cook muffins or mini-pies, little puddings, cheesecakes. Any mini-dessert you’ll willing to make will fit into Lekorna tarts perfectly and will transform your break or party into a special and tasty event. Also, need to worry about the weight of filling or high temperature, tarts will easily stand them.